EDS – Applied Engineering Solutions (AES) chose the SAE World Congress to introduce a captive audience to its latest technology for the automotive industry. The challenge was to attract SAE attendees to visit an off-site location to learn about how AES technology helps companies work smarter and faster. Simply put, the solution was “Smartville”. A ballroom in a downtown hotel was transformed into a town-like setting where visitors could enjoy a host of amenities, tour product demonstrations, and attend educational forums. Mailings included a ”Greetings from Smartville” picture postcard and a trip-planning invitation containing information about the venue. 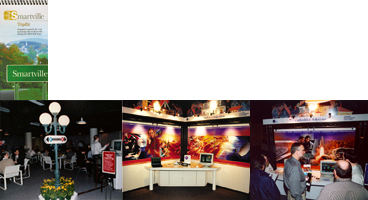 Inside Smartville, teaching murals served as backdrops in display booths, showcasing EDS-AES target markets. To guide visitors to Smartville, “road signs” were strategically placed around the hotel. Nearly 400 people matching AES target client expectations visited Smartville. According to results from the post-event survey, participants left with a much better understanding of AES business. The event resulted in significant lead generation, actual sales, and several media mentions in national publications.